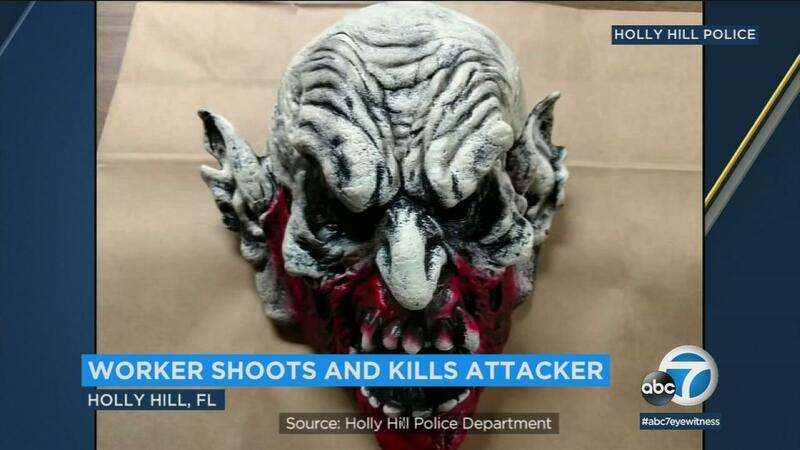 A man in a monster mask attacked a Little Caesar employee in Florida, but his intended target pulled out a gun and killed the attacker, police said. The incident occurred on Saturday night at Holly Hill, near Daytona Beach, and part of it was captured by surveillance cameras. The video shows the man in the mask walking around the parking lot with a big stick in his hand. Moments later, the pizza delivery man closes the night and steps out the door. The employee is baffled, hit by the stick on his face and shoulders and then attacked with scissors. There's the Police The little Caesar's employee pulled out his own weapon and shot the man into the mask several times. The police arrived a few minutes later and the attacker was taken to the hospital and declared dead. The police have not yet said whether the attacker and restaurant staff knew each other or what led to the incident.